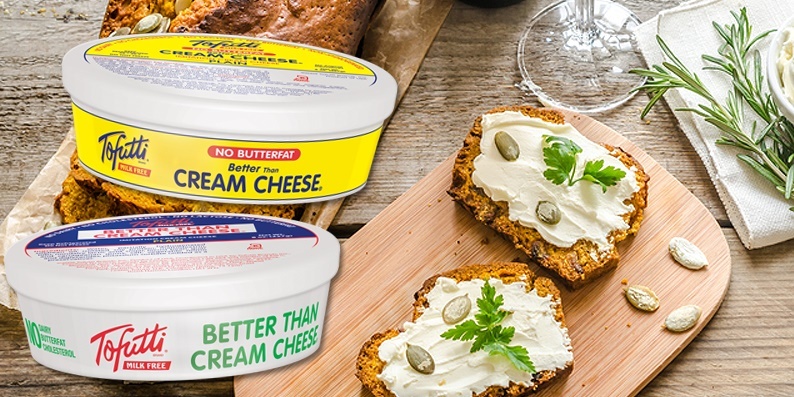 As they seemingly phase out their hydrogenated version, Tofutti Better Than Cream Cheese now comes in four non-hydorgenated dairy-free varieties. 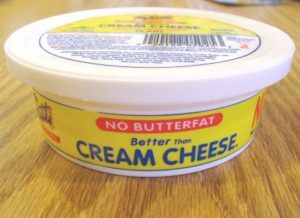 To date, we’ve only sampled the classic non-hydrogenated Tofutti Better Than Cream Cheese, but that was enough to impress. Upon first taste we were truly surprised by how much it really does taste like cream cheese. The texture is unbelievably perfect: soft, rich, and 100% creamy. Though it has been a while since I have had traditional dairy cream cheese, Tony, who has more recently had dairy, confirmed that it is near identical, but perhaps just a touch less sharp than cream cheese made from cow’s milk. As an initial test, I prepared carrot cupcakes with “cream cheese” frosting made of Tofutti Better Than Cream Cheese, dairy-free buttery spread, powdered sugar, and real vanilla. I took them to a small dinner party of dairy consumers, and everyone loved them; not a single person could tell the difference. Then, I trialed Tofutti Better Than Cream Cheese as a bagel spread, topped with capers and wild smoked salmon. I was more than pleased. The Americanized bagel and lox combo is back on my lunchtime menu. Though I’ve yet to trial Tofutti Better Than Cream Cheese in a vegan cheesecake, I have heard rave reviews from others who have ventured it. And luckily, I have the cookbook, Amazing Dairy-Free Desserts on hand. The author explains how to best use Tofutti (apparently there is a trick or two) and offers six different “cheezecake” recipes. Dairy-free Toffee Pecan Cheesecake anyone? 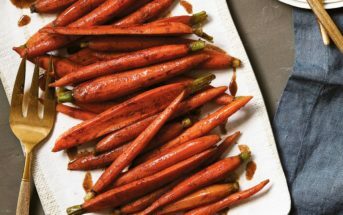 At first look, this Tofutti Cream Cheese alternative appears to be an exact match with traditional cream cheese; a soft white sort of paste in a traditional “easy access” tub. Smoothing it across the top of a whole wheat english muffin, it even spread as nicely as the real thing. In terms of taste, they don’t hit the nail exactly on the head, but I honestly really like it. The first bite yields a smooth, creamy texture across the tongue, and a pleasant sort of sour tang, such as one might find in many soy yogurts. I detected an aftertaste of soybeans, but found it really enjoyable. Certifications: Tofutti Better Than Cream Cheese is Certified Kosher Parve. 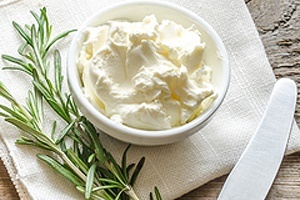 Dietary Notes: By ingredients, Tofutti Better Than Cream Cheese is dairy-free / non-dairy, egg-free, gluten-free, nut-free, peanut-free, vegan / plant-based, and vegetarian. Nonetheless, verify on the label and check with the company on their manufacturing processes for all varieties if potential allergen cross-contamination is an issue for you. Processes, ingredients, and labeling are subject to change at any time for any company / product. For More Product Information: Visit the Tofutti website at www.tofutti.com. Convincing enough to fool dairy-lovers in cream cheese frosting, this classic brand has been around for ages for a reason. 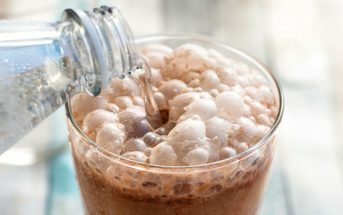 Unfortunately for many, it is soy-based, but for those who do eat soy in moderation, it’s a creamy splurge fit for bagels, cheesecakes, and cream cheese-swirled brownies. And I don’t have a soy allergy either. 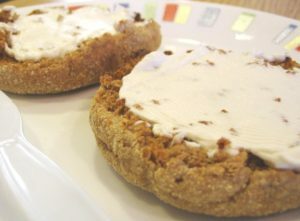 A near tub of Tofutti cream cheese on a few bagles today – killed my weekend. My reaction is much worse & different than eating dairy itself. Stomach cramping, gurgling & felt like a blob of mass that wan’t going anywhere – then BAM. Boy did this make me sick. This is not the first time Tofutti brand dairy free has made me sick. If you eat way too much of dairy free anything – it’s not that great. But Tofutti itself – must make it’s great tasting things chemically different. I know I can’t eat casein. The only thing I can think of is there is SO MUCH ISOLATED SOY PROTEIN. If I google isolated soy protein – they sell it with whey & casein (I can’t digest casein either) – as isolated soy protein appears to be a somehow related product to whey & casein. My wife is Asian & I have no problems with soy sauce or things like soybeans. Perhaps the there is so much isolated soy protein in this – that is the problem. Too bad because I really like the Tofutti taste. Hi Ryan, This is terrible. But isolated soy protein isn’t related to casein or whey at all. Casein and whey are the two main proteins in dairy. While soy protein is the protein from soy – it is free of all dairy and isn’t related to dairy in any way. The only thing they have in common is that both dairy proteins and soy protein are complete proteins, which means they contain all essential amino acids. This is why on some forums people might compare soy to dairy. But they are in no way the same. Tofutti is a dairy-free brand. It is possible to have an issue with soy, which is in a lot of products. As a heads up, we don’t share anything here that contains any dairy, in any form. I’m allergic to casein myself! Tofutti brand makes me sick worse than dairy itself. Stomach gurgling for days. Some weird chemical other than casein. Possibly soy protein. Ruined my holiday weekend & Tofutti did this to me last year. I eat spy sauce dishes almost daily fyi. I’m giving up Tofutti brand. More importantly is it GMO free?